1. Slice stems off of mushrooms, leaving only the mushroom caps. Rinse and pat mushrooms dry. Toss mushroom caps gently in olive oil and arrange on a baking sheet, stem side up. Roast mushroom in the oven at 450˚ for 30-35 minutes or until golden brown and crispy. Remove mushrooms from oven and let cool for 10 minutes. 2. While mushrooms are baking, add remaining oil to a small skillet and heat to medium-high heat. 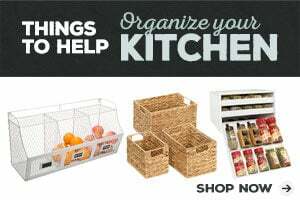 When oil is heating, drain capers and pat dry with a paper towel. Then carefully add capers to the hot oil and saute for about 3-5 minutes or until they appear crispy. Remove from oil when done and set aside. 3. Take 1 slice of smoked salmon or lox and cut it in half. Then fold into quarters so it's roughly the size of the mushroom cap. Place folded lox on each mushroom cap. 4. 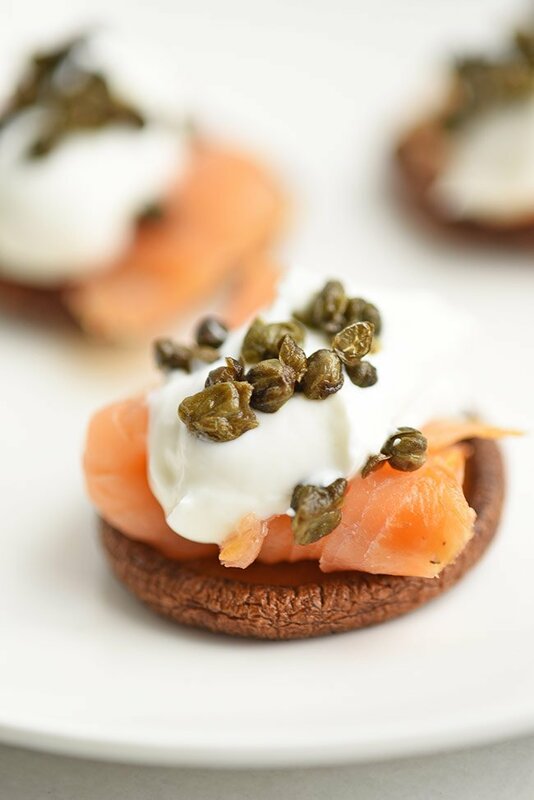 Layer 1 tbsp of cream cheese or Greek yogurt on top of the salmon then top with fried capers. 5. Optional garnishes: fresh sprig of dill and/or a sliver of red onion. May I offer you some crispy mushroom caps with capers, cream cheese and lox? Hold on to your hats! We’re getting fancy here. But not fancy in a this-took-forever-to-make kind of way. No, no. We don’t do that. These crunchy, delicious little mushroom caps are super easy to pull off. I’m going to be honest with you. These are not anything I would have thought to make. All credit goes to my hubs. See, the Mr. is a lot more adventurous when it comes to cooking. I like to start with something familiar and then tweak it to my liking. Not him. He likes to browse the grocery store isles for inspiration, grab a few seemingly random, sometimes unheard of, things of the shelves and then a few hours later at home, after we’ve unpacked and he’s made a mess of the kitchen, he calls me over to come try what’s on his plate. That’s pretty much how these mushroom caps came to be. I asked him for help coming up with an appetizer since New Years and Christmas parties are coming up fast! I love love love holiday parties because they typically involve our very best friends, a lot of laughter, an excuse to drink champagne, and lots of course, lots of amazing appetizers. Appetizers that are really going to be dinner because there’s not a main course. And that’s the best part. You can graze on all sorts of different and delicious foods throughout the evening without having to commit to sitting down or getting that full-belly sleepy feeling. If I had the choice, appetizers for dinner would be a regular thing. So, real quick. Let’s talk about these crispy mushrooms caps. I’m giving you options here. 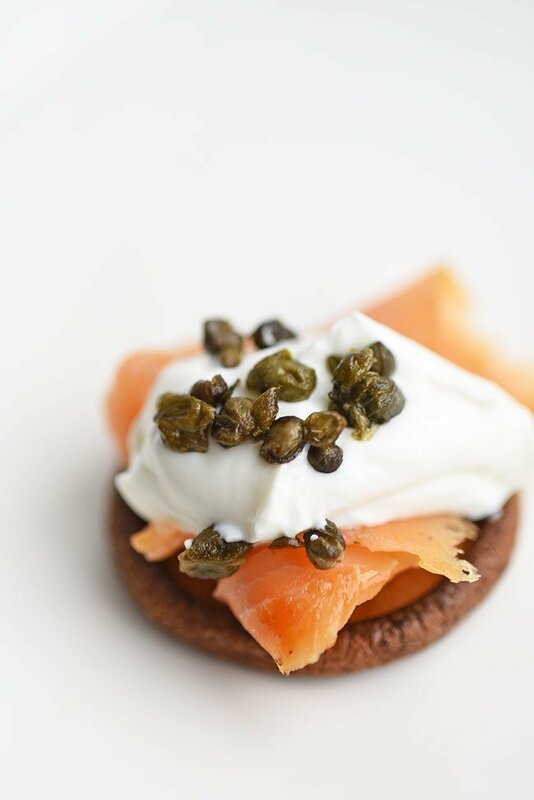 I really like the taste of the traditional combination of cream cheese and lox but you can actually use Greek yogurt in place of cream cheese for a different, more refreshing, less-creamy flavor. Also, healthier. So, I’ll leave that up to you. Both are good or if you can’t decide, mix them together for a half and halfsie situation. You could also use neufchâtel cheese if you’re counting calories. What’s the difference between lox and salmon? One final thang and then I’ll let you get on to the recipe. Lox. If you’re not familiar with lox, then I can tell you, in a nut shell, it’s salmon. For this recipe, you can use smoked salmon or you can use traditional lox. The difference is that lox is actually cured salmon, not smoked. So, if you enjoy that extra smokey flavor, then go ahead and grab the smoked salmon. If not, find yourself some traditional lox. These sophisticated little appetizers are perfect for a holiday party, a shower, or put them on your wedding menu to serve during cocktail hours. You can even dress them up if you’d like by adding chopped red onion and fresh dill. 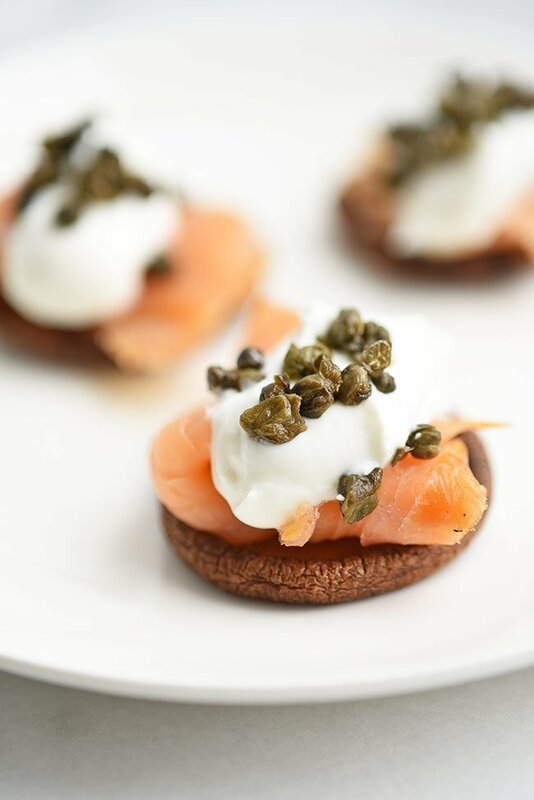 These crispy mushroom caps with capers and lox were featured on Pinterventures and on South Your Mouth!